Climate change is a very complex subject. Scientists from many countries around the world are striving to understand how climate change works and then to try to prepare for the changes that may lie ahead. This resource includes a series of activities for students, background information and teaching tips on current climate change issues. It brings together several sources of data on the Earth's climate, and also examines Mario Molina's work on ozone and its impact on global politics. Climate Change includes student worksheets to encourage students to form their own opinions (based on the data) and to generate classroom discussion and debate. it is a flexible resource for 11-19 year old students and can be used to study both ideas and evidence and the nature of science, and also when teaching key skills. 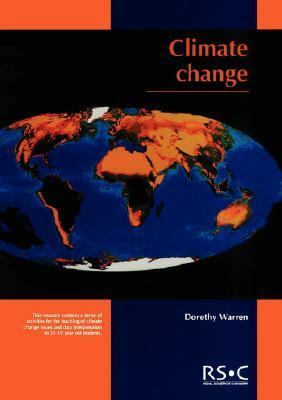 All the material and activities have been compiled by Dorothy Warren, the Royal Society of Chemistry Teacher Fellow 1999-2000 and have been trialled in schools where they have worked in a classroom setting.Warren, D. is the author of 'Climate Change' with ISBN 9780854049547 and ISBN 0854049541. Loading marketplace prices 125 copies from $19.53 How does the rental process work?